“There is a difference between a good company and a great company. A good company offers excellent products and services. A great company also offers excellent products and services but also strives to make the world a better place” (William Clay Ford, Jr., Chairman of the Board and CEO from Kotler and Lee 2005, p. 6). As this quote clearly demonstrates, the importance of corporate social responsibility (CSR) is on the rise. Indeed, more and more companies are engaging in CSR-related activities such as cause-related marketing (CRM), employee volunteering (EV) or corporate philanthropy (CP) (e.g. Lichtenstein, Drumwright, and Braig 2004, p. 16). According to Bhattacharya and Sen (2004, p. 9) more than 80% percent of Fortune 500 companies deal with CSR issues in the United States (US). In European countries such as Germany, the numbers of companies with CSR initiatives is similarly growing (de Gilder, Schuyt, and Breedijk 2005, p. 143). Among those firms are famous examples such as Starbucks and The Body Shop (e.g. Lindgreen, Swaen, and Wesley 2009, p. 251) as well as the German companies BMW or SAP. There are several reasons for this trend. On the one hand, companies are increasingly put under pressure to behave socially responsible from different sides. First, consumers today are more sensitive to business practices of companies (e.g. Mohr and Webb 2005, p. 121) and can exert their power by means of boycotts (e.g. Sen, Gürhan-Canli, and Morwitz 2001, Smith 2003, p. 60) resulting in negative economic consequences for firms. This is especially the case in times of increasing media coverage and advances in information technology (e.g. Wagner, Lutz, and Weitz 2009, p.77) where bad business practices become more easily transparent. Particularly, recent corporate scandals like those of Enron, or Shell, among others (Crampton and Patten 2008, p. 863), make a contribution to consumers’ skepticism (Yoon, Gürhan-Canli, and Schwarz 2006, pp 377). Then, globalization leads to new challenges for companies because on the one hand, they are operating in countries with lower standards of living resulting in higher needs for socially responsible behavior in the respective society (e.g. Smith 2003, p. 60). On the other hand, worldwide competition is being strengthened in markets, which are characterized by low levels of product differentiation. CSR offers a source of competitive advantage (e.g. Porter and Kramer 2002) because it enhances the overall reputation of the company (e.g. Menon and Kahn 2003) and provides a valuable basis for differentiation (e.g. Du, Bhattacharya, and Sen 2007). Besides that, companies are feeling pressure by a rise in public standards for social performance (e.g. the United Nations Global Compact) (Pirsch, Gupta, and Grau 2007, p. 125). On the other hand, there is evidence that CSR is not only “the right thing to do” but it also leads to “doing better” (Bhattacharya and Sen 2004, p. 9) because there is a positive relationship between a company’s CSR activities and its stakeholders; especially consumers can be positively influenced (Bhattacharya and Sen 2004, p. 9). For one thing, market polls confirm the benevolent reactions of consumers to these kinds of companies (e.g. Cone Corporate Citizenship Study 2007). Furthermore, a rising stream of academic marketing research attests to the fact that engaging in CSR activities is a business strategy worth doing. By means of lab experiments and field studies, it was found out that CSR has an impact on consumer product responses as well as on their attitude toward the firm (Brown and Dacin 1997). CSR is also reported to positively influence customers’ satisfaction (Luo and Bhattacharya 2006) as much as customers’ identification with the company (Sen and Bhattacharya 2001). These internal aspects can translate into behavioral outcomes such as product purchase, which in turn can improve a company’s financial performance (Luo, Bhattacharya 2006). Thus, CSR is also of increasing interested from academia (Marin, Riuz, and Rubio 2009, p. 65). However, more research is needed. Most empirical studies give a rather incomplete picture of CSR (e.g. Maignan and Ferrell 2004, p. 4; Houghton, Gabel, and Williams 2009, p. 477, Vaaland, Heide, and Gronhaug 2008, p. 946) as they do not consider single CSR activities but view CSR as a whole program. This is in part responsible for the fact that past studies, especially when investigating the effects of CSR on financial outcomes, have lead to controversial results (Halme and Laurila 2009, p. 326). Hence, the urgent need for research comparing the outcomes of different CSR activities has been emphasized (e.g. Hillman and Keim 2001, Aguilera et al. 2007, Wang, Choi, and Li 2008, p. 157). As was stated: “Future research should examine variation in the outcomes of specific types of CSR” (Barnett 2007, p. 809). Besides that, with CSR being a “high-profile notion” (Luo, Bhattacharya 2006, p. 1) today, it is beyond dispute if a company should engage in CSR. Rather, the focus is now shifting from whether addressing CSR to how addressing it, i.e. the implementation of CSR practices (Sen and Bhattacharya 2004, p.10). As Smith (2003, p. 72) puts it, “there remain major challenges in developing and implementing CSR strategy, especially (…) engaging with stakeholders.” Thus, research should not only be concerned about which CSR activity to use but also about how the effectiveness of these activities can be improved. Having a look at business practices from other areas such as new product development (NPD), it has been proven that customer integration (CI) is an excellent way of receiving successful results (e.g. Cooper and Edgett 2008, pp. 48, Franke and Piller 2004). Therefore, it would be reasonable to extend the phenomenon of CI to the CSR realm, particularly when investigating customer outcomes. Though CI in CSR has been proposed by conceptual papers (e.g. Bhattacharya, Korschun, and Sen 2009, p. 257), empirical research on this topic has been extremely scarce so far and is rather non-existent. 1. What are the main effects of CSR? 2. What are the relative effects of single CSR activities? 3. Can the main effects of CSR be intensified when customers are integrated? In order to find an answer, the empirical investigation of the thesis deals with CSR outcomes. In a first step, the study looks at whether CSR has effects at all. In doing so it replicates the findings of former studies to confirm their results and thus respond to the first question. Therewith the approach is consistent with studies examining individual responses to CSR, yet it has two important differences and thus contributes to existent literature: first, the single CSR activities are also compared in view of those customer responses and secondly, the approach takes a broader stakeholder perspective by additionally considering the effects when customers are integrated. 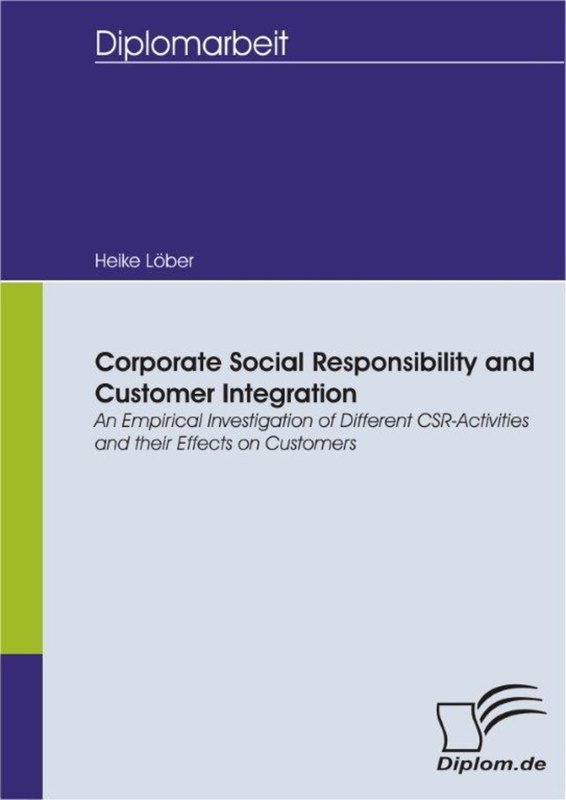 Chapter 2.1 is the CSR part which begins by defining CSR and the relevant activities used in this study. In this conceptual section, key characteristics of CSR as well as the question of CSR’s legitimacy will be discussed by mentioning the shareholder view of companies and the stakeholder theory. Moreover, a short comparison of CSR in America and Germany will be dealt with to show cultural differences in the CSR concept. This will be followed by a review of the literature that takes into account customer reactions to CSR and a comparison of single CSR activities. Subsequently, a theoretical framework for CSR is presented. The CI section as depicted in chapter 2.2 proceeds in a similar fashion: first the concept of CI is introduced by looking at the phenomenon in the NPD realm which will be extended to the CSR field. Here, practical examples will be provided. Next, a review of the literature of empirical studies connected to CI will be given as well as an appropriate theoretical framework. In chapter 3, the hypotheses will be developed. These will be arranged in three groups corresponding to the three research questions. Their development will be based on results of previous studies and by looking at relevant theories which are the following: Social Identity Theory (SIT), Attribution Theory (AT), Moral Behavior and Behavioral Decision Theory (BDT), Means-end Theory as well as Empowerment Strategy. With this, the model to be examined will be generated. After that, chapter 4 is going to deal with the empirical investigation. First, the theoretical foundations of the experiment and the Analysis of Variance will be presented which will be followed by the description of the experimental design and the results of the analysis. Finally in chapter 5, the results will be discussed, limitations of the study will be mentioned and suggestions for future research will be made. Additionally, the thesis provides managerial implications. 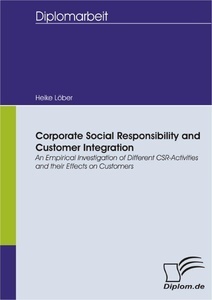 In the next paragraphs, all aspects connected to CSR will be presented, ranging from its definition, its key characteristics, the shareholder view of the company and stakeholder theory to a comparison of the US and Germany as well as to proven outcomes of CSR with regard to customers and a theoretical framework. For the definitions, Carroll’s detailed description of CSR depicted in the pyramid metaphor is to be introduced as a classic, followed by a broader conceptualization, which will be the basis definition of the current thesis. The notion CSR is often referred to similar concepts such as corporate citizenship, corporate social responsiveness, corporate social performance, and stakeholder management (e.g. Sen and Bhattacharya 2001, p. 226, Lindgreen, Swaen, and Johnston 2009, p. 252, Kotler and Lee 2005, p. 2). They all have in common that they deal with a company’s obligations beyond its primary function that consists of making a profit (Houghton, Gabel, and Williams 2009, p. 477). However, just as there are so many terms, a variety of definitions can be found in the profuse CSR literature, both in academic and in practitioner, as is apparent from table 1. This array notwithstanding, no universally applicable definition has been found so far (Schmidt 2009, p. 12). A main reason for the complex character of CSR is that it connects business and society. Yet, societies are varied to a high degree making it almost impossible to come to a single agreed-upon definition (Halme and Laurila 2009, p. 327, Maignan and Ferrell 2003) leading to this abundance of descriptions and sister concepts instead. First efforts to construct a coherent account of what CSR really is were made starting in the 1950s with Bowen (1953) who is considered as the father of the academic debate on CSR (Carroll 1979, p. 497). He realized that business has an influence on the lives of human beings in varied areas and from that, he concluded that the social responsibility of a company must be geared to expectations and values of society (Bowen 1953). After him, further definitions have been proposed. These abundant attempts in coming closer to a concrete and single understanding of CSR embrace both broad ones (e.g. Brown and Dacin 1997, Davis and Blomstrom 1975) and narrow, more specific ones (e.g. WBCSD, McWilliams and Siegel 2001, Carroll 1979) with different foci (e.g. Kotler and Lee 2005, Bowen 1953) as indicated in the table. One of the most commonly cited conceptualizations in this connection has been put forward by Carroll (1979). He tried to classify earlier definitions and differentiated four types of social responsibility: economic, legal, ethical, and philanthropic obligations (Carroll 1979, 1991). This categorization has become famous under the name “The Pyramid of CSR” (Carroll 1991) which is illustrated in figure 1. Economic responsibilities are the most essential ones of a company. This is demonstrated in the pyramid metaphor because they represent the lowest layer and therewith the fundament of the figure. As companies are the “basic economic unit in society” (Carroll 1979, p. 500), it is about producing products and services which are demanded by the members of society and about making a profit in this way. For this is the most elementary component of operating a business. All other responsibilities are built upon it because without being economically successful, a business cannot survive (e.g. Chen, Patten, and Roberts 2008, p. 132) and all other responsibilities become superfluous (e.g. Carroll 1979). Following those, there are legal responsibilities. These refer to laws and regulations imposed by federal, state, and local governments of the country in which the company operates. They form the framework of rules the company has to obey in all its business decisions. This means that apart from making a profit, society expects a company to follow governmental instructions when doing their business. Even though legal responsibilities are the next stage of the pyramid, they are equally important as economic ones (Carroll 1979, p. 500). The next types of responsibilities are ethical obligations. They embrace all activities and practices that are expected and required of companies by society but which are not anchored in law. In other words, “[they] embody those standards, norms, or expectations that reflect a concern for what consumers, employees, shareholders, and the community regard as fair, just or in keeping with the respect or protection of stakeholders’ moral rights” (Carroll 1991, p. 229). On the highest layer of the pyramid, discretionary responsibilities can be found. They constitute this area of responsibility where companies are supposed to slip into the role of good corporate citizens and take care of human welfare or keep up society’s goodwill. These kinds of responsibilities are not expected in an ethical sense and this is what distinguishes them from ethical responsibilities. That is, companies are not regarded as being unethical if they do not engage in activities that explicitly provide human welfare such as CP, i.e. giving money to social causes. It is rather related to – as implied by the name – discretionary or voluntary initiatives and practices which are, though not expressly required still expected by society. In this way, although they are very welcomed, they are less important than the other three components of CSR. As Carroll (1991, p. 229) explains: “Philanthropy is icing on the cake - or on the pyramid.” Taken together, this pyramid metaphor is used to show that CSR consists of different components. They are all interrelated and part of a whole, and thus neither cumulative nor separated. A single business practice can concurrently comprise more than one of these responsibilities. It also emphasizes that generating payment surpluses is not in contrast to socially responsible behavior but a part of it (Carroll, 1979, 1991). According to this definition, “a CSR firm should strive to make a profit, obey the law, be ethical, and be a good corporate citizen” (Carroll 1991, p. 229). This attempt of giving CSR a face is rather detailed by showing various components of the CSR concept. It is, therefore, not applicable to all areas, especially not for all national contexts outside the USA (e.g. Maignan 2001). For this reason, a less specific conceptualization is taken as the basis of this thesis. By being more general, this definition tries to overcome the ambiguity that arises from the diverse concepts (Crane, Matten, and Spence 2008 p. 5). It has been used in contemporary marketing studies dealing with CSR and its relationship to different stakeholders like customers (e.g. Sen and Bhattacharya 2001). Here, CSR is defined as “the organization’s status and activities with respect to its perceived societal obligations” (Brown and Dacin 1997, p. 68), which has been expanded with “or, at least, stakeholder obligations” (Bhattacharya and Sen 2004, p. 9). This approach is more suitable for the current thesis as it explicitly considers stakeholders which are an important part of the study as it will investigate how consumers react to different CSR activities and if these responses are improved when they have a say in the company’s CSR decisions and implementations. Besides that, it does not expressly include economic, legal, and ethical responsibilities, which are parts of CSR that will not be taken into account in this thesis. Instead, the focus is mainly going to lie on discretionary activities such as CRM, EV, and CP. Although there is a plethora of different definitions from which two have been discussed more explicitly, there are some key characteristics that belong to CSR, regardless of how exactly it is described. First of all, CSR is not a new phenomenon (Smith 2003, p. 53). For one thing, first attempts of a CSR conceptualization have already started in the 1950s (e.g. Schmidt 2009, p. 5; Maon, Lindgreen, and Swaen 2009, p. 72). What is more, CSR has already existed in the times of industrialization when entrepreneurs had, for example, tried to create good working as well as housing conditions for their workers (Schmidt 2009, p. 9, Smith 2003, pp. 52). Nevertheless, it is true that the occurrence of CSR today is a rising trend and that it has become “one of the buzzwords of our times” (Filho and Pawlak 2009, p. 62). Besides that, all types of CSR are connected to social issues such as consumerism, human welfare, product and working safety or protection of the environment. These topical areas of CSR are, however, subject to change over the course of time. Protection of the environment, as an illustration, has not always been on the corporate agenda but has recently been given extraordinary attention by corporations. Moreover, the importance of single CSR issues is contingent upon the industry sector. That is, a real estate company, for example, is less concerned about product safety than a company producing toys or car manufacturers (Carroll 1979, p. 501). Furthermore, there can be different motivations for companies carrying out CSR initiatives. In looking at them, it is possible to distinguish two opposed cases for CSR: the normative case and the business case (Smith 2003, p. 53). On the one hand, a driving force for companies engaging in a CSR activity can be the fact that they simply wish to do good. Under these circumstances, CSR is regarded as the normative case. Here, the company takes up the role of a good citizen and CSR is regarded as being the right thing to do. This is based on social contract theory (e.g. Thomas Donaldson 1982, p. 42) according to which business is merely possible “through the cooperation and commitment of society” (Smith 2003, pp. 58). It is an implicit contract between the company and society, a social contract. The most elementary form of it consists in identifying what a company needs from society and what in turn it must give back to society (Smith 2003, pp. 58). On the other hand, companies can be prompted to behave in a socially responsible manner for the reason of enlightened self-interest. In this connection, CSR conforms to the business case. This means that the company rather considers how it can apply CSR activities in order to further their economic success with them. In doing so, CSR is particularly related to corporate economic performance (e.g. Lev, Petrovits, and Radhakrishnan 2010) and implies benefits such as less employee turnover leading to lower costs of staff recruiting, competitive advantages (e.g. Porter and Kramer 2001), improved corporate image or customer patronage (e.g. Bhattacharya and Sen 2003). Even though the differences between those two cases are obvious, a mixture of both of them mostly underlies the company’s decision of practicing a social activity (Smith 2003, p. 53). CSR understood as being responsible to the society at large is, however, not only positively appreciated. Instead, CSR rather possesses a contested nature (Crane, Matten, and Spence 2008, pp. 21). Accordingly, in the debate about the legitimacy of CSR, there are different voices about what it means to be socially responsible and if it belongs to the field of duty of business. Different arguments can be depicted in two concepts central to CSR: the shareholder view of the firm and stakeholder theory. According to the Shareholder View, a company is meant to solely concentrate on those stakeholders who take a financial share in the company, i.e. shareholders. Thus, this view states that a firm’s single purpose is to serve the needs and interests of the corporation’s owners as is claimed by one of its main theorists Milton Friedman. He fiercely criticized broader conceptions of the social role of business (Smith 2003, p. 64). In his article “The Social Responsibility of Business is to Increase Its Profits”, he argues that: “Responsibility is to conduct the business in accordance with their [shareholders’] desires, which generally will be to make as much money as possible while conforming to their basic rules of the society, both those embodied in law and those embodied in ethical custom” (Friedman 1970, p. 1). This implies that the social obligations of a company are already fulfilled by conventional business practices (Smith 2003, p. 65). The reasons therefore are that unlike human beings, the corporation as such cannot take on responsibility. Only people working there can hence do so whereby managers, however, are not entitled to spend the money of shareholders on issues other than business matters. This is particularly the case as managers cannot solve social problems because this does not belong to their expertise. Engaging in social issues is the task of the government, charitable NPOs or individuals. The duty of private firms and their managers only consists of enhancing their operational efficiency. Consequently, a consideration of non-shareholders’ interests is not necessary. Instead, those of shareholders dominate so that a company’s economic goals, i.e. producing goods and services and thereby maximizing returns for the shareholders, are paramount (Crane, Matten, and Spence 2008, p. 24, Friedman 1970). Although this criticism has been put forward in the 1970s, Friedman’s arguments are still part of today’s skepticism about CSR. Indeed, “corporations often struggle, (…), in deciding how to reconcile (…) social demands with those of shareholders for profit maximization. Although the majority of studies on the topic have found a significant positive relationship between (…) CSR and financial performance [e.g. Margolis and Walsh 2001], the payoff from socially responsible programs is not guaranteed and may take time. For this reason, many managers still view CSR as an expense rather than an investment” (Mohr and Webb 2005, p. 122). Whereas the shareholder view thus argues against the necessity of a company’s responsible behavior towards individuals or groups other than its owners, Stakeholder Theory, provides forceful arguments for why firms should be motivated to invest in CSR programs (Pirsch, Gupta, and Grau 2007, p. 127). This theory refrains from the view that merely the interests of shareholders are legitimate and instead focuses on all stakeholders by pointing out that a company is a “nexus of (…) stakeholders” (Maignan and Ferrell 2004, p. 5). These stakeholders have been defined by Freeman, the main representative of stakeholder theory, as “any group or individual who can affect or is affected by the achievement of the firm’s objectives” (Freeman 1984, p. 25). It is, therefore, legitimate for a company to likewise take into account their power and influence, that is, the corporation should meet the needs of its various stakeholders when fulfilling its business task (Pirsch, Gupta, Grau 2007, p. 127). This can be constituted from a moral point of view: if a company has an impact on individuals or groups for achieving its business objectives, then those affected have a legitimate interest in the firm. With this, it is morally right to make allowance for the interests of all of them (Mitchell, Agle, and Wood, 1997) as “there is no prima facie priority of one set of interests and benefits over another” (Donaldson and Preston 1995, p. 68) such as those of shareholders. Moreover, an instrumental perspective can give reason for why stakeholders should be considered (Maignan and Ferrell 2004, p. 5). Stakeholder theory suggests on the basis of resource dependence theory that a firm’s contingency and success depends on primary stakeholders and their delivery of necessary resources respectively (Maignan and Ferrell 2004, p. 5, Hillman and Keim 2001, p. 126). These primary stakeholders, therefore, are vital to a corporation’s survival. Clarkson (1995, p. 106) explains that “primary stakeholder groups typically are comprised of shareholders and investors, employees, customers, and suppliers, together with what is defined as the public stakeholder group: the governments and communities that provide infrastructures and markets.” For this reason, the very purpose of the company is to serve and coordinate the interests of its various stakeholders and not only those of its shareholders as it applies to the shareholder view. Since many of these stakeholders’ interests exceed the pure economic goal of making a profit, the remaining non-economic concerns can be addressed by means of CSR (Pirsch, Gupta, Grau 2007, p. 127, Maignan and Ferrell 2004, pp. 6). This is particularly important as the attitudes of many individuals have altered (e.g. Schmidt 2009, p. 16) shown in the fact that they now demand more responsible actions on the part of companies (Smith 2003, p. 55, de Gilder, Schuyt, and Breedijk 2005, p. 143). Taken together, “stakeholder theory suggests that firms are motivated to broaden their objectives to include other goals in addition to profit maximization. Based on this theory, many companies embrace a Corporate Social Responsibility program as a way to promote socially responsible actions and policies, and effectively respond to stakeholder demands” (Pirsch, Gupta, and Grau 2007, p. 128, Maignan and Ferrell 2004). Moreover, this theory specifies to whom business should be socially responsible. It had been criticized that this question is not being answered in earlier CSR definitions like in the one of Bowen (1953) (Maignan and Ferrell 2004, p. 4, Clarkson 1995). In fact, such a conceptualization is too broad so that with stakeholder theory, CSR was further developed from being a social obligation to being a stakeholder obligation, i.e. companies are not responsible toward society as a whole but toward its stakeholders (e.g. Maignan and Ferrell 2004, p. 4). This had also been added to the definition underlying this thesis. Although there is sufficient evidence that companies can accomplish benefits from all stakeholder groups when practicing CSR, this study concentrates on customers as a stakeholder group and among others, aims at showing how companies can maximize their benefits from them by integrating them. The difficulty of coming to a single and globally valid definition, understanding and implementation of CSR is also rooted in the fact that there are cultural differences in the perception and evaluation of CSR as has been shown in several studies (e.g. Maignan and Ferrell 2000, 2001, 2003). As most of the research used in this thesis is from the US and as the study has been conducted in Germany, differences in the nature of CSR as perceived by customers from both countries are depicted in the following. Focusing on customers is besides that essential in this thesis for they are the focus of the study. Maignan and Ferrell (2003), for instance, demonstrate that consumers differently evaluate the importance of Carroll’s four types of responsibility due to their coming from individualist or communitarian societies. In their study in which they compare consumers from the US and Germany among others, they draw on Lodge’s (1990) discussion of national ideologies because those are expected to underlie consumers’ depiction of CSR. Even though those two countries share certain features, i.e. they are both Western democracies with similarly developed economies; they differ in their national ideology. The US are described as an individualist society (Googin and Rochlin 2008, p. 469) emphasizing the “short-term betterment of the individual” (Maignan and Ferrell 2003, p. 57, Hofstede 1994) whereas Germany is assigned to a communitarian society with a focus on collectivist values, the community, and the consensus. Accordingly, as was found out in the study, American consumers appreciate the economic responsibility as the main one because in their opinion, each actor has to look out for its own survival which would be to remain profitable and productive for a company. Their European counterparts, in contrast, assume the other three levels of responsibility as more important. Business is meant to contribute to society in general such that self-interests of the firm are considered inappropriate. When questioning to whom business should be responsible, cultural differences appeared likewise. Considering customers, investors, employees, and the community as stakeholders, both German and American participants ranked responsibility to customers in first place. The community was also found to be placed in the middle for both countries. However, for German consumers, employees directly followed and for American consumers those lagged behind. Conversely, responsibility to shareholders was allocated less importance in Germany than in the US. This again shows that the US has adopted the principles of economic liberalism leading to a model also called “shareholder capitalism” (Googin and Rochlin 2008, p. 470). Following those results, Maignan and Ferrell (2003) conclude that in Germany, companies are above all social agents acting responsibly to customers, employees and the society at large. This is in contrast to the American understanding of CSR where there is much more of a plea for the shareholder approach as opposed to the stakeholder approach demanded for in Western European countries (de Gilder, Schuyt, and Breedijk 2005, p. 143). The findings also suggest that companies in different countries should emphasize different CSR initiatives. Therewith, this study points to the fact that establishing a consistent, culturally comprehensive picture of a socially responsible company is a challenging task. Differences between America and Germany cannot only be found in varied consumers’ perceptions of it but also in its implementation and its academic discourse. In America no standard CSR belief exists and the idea of what it means to be socially responsible differs from company to company. For this reason, “the practice of CSR in the US is evolving and accelerating at an uneven path across industries and within firms” (Griffin and Vivari 2009, p. 235). This tendency may be also due to the fact that the US emphasizes individual rights and freedom embedded in the American dream which “continues to be based on an individual founding his or her own business and being set free to prosper within an environment involving minimal regulation and constraints” (Googin and Rochlin 2008, p. 469). As a consequence, the government refrains from too much regulation (Googin and Rochlin 2008, p. 472) and thus, the voluntary character of CSR is highlighted (Griffin and Vivari 2009, p.235). With this, both leading CSR companies and firms totally ignoring it can be found at the same time. Nonetheless, CSR is also growing in the US, mostly because of stakeholder pressure (Griffin and Vivari 2009, pp.235). Even though in Germany there is also ambiguity about what CSR exactly corresponds to and albeit it is a matter of choice, too, a much more intensive approach of institutionalizing it is present here. This institutional framework is provided both from the private sector such as the portal “CSR Germany” (www.csrgermany.de) developed by the Confederation of German Employers’ Associations (BDA) and the Federation of German Industries (BDI), and from the public sector like the German Federal Environment Ministry (BMU) by providing “the legal framework upon which industrial activities take place and industry operates” (Filho and Pawlak 2009, p. 64). These try to assist companies on CSR-related issues because CSR is also an individual and not a “one-size-fits-all” approach in Germany (Filho and Pawlak 2009, pp. 61) as is suggested by the WBCSD (World Business Council for Sustainable Development) (e.g. Smith 2003, p. 66). As far as academic research on CSR is concerned, it can be stated that this has mainly started in America. As already described, first steps of a concrete definition have began there in the 1950s with Bowen’s publication of “Social Responsibilities of the Businessman”. Several authors (e.g. Davis and Blomstrom 1975) followed him and tried to further conceptualize it like Carroll with his CSR pyramid in 1979 (e.g. Carroll 1979). These attempts were criticized by Friedman who postulated that the primary objective of business is to make a profit. Yet, his arguments in turn were refuted by Freeman and his stakeholder theory (e.g. Schmidt 2009, pp. 5). While the debate about CSR in America has thus been launched half a century ago, the academic CSR discourse in Germany has only taken place from the 1990s on. Since then, however, an increasing tendency of scientific publications on this topic can be recognized (e.g. Homann 1997, Eberl and Schwaiger 2004). At this juncture, the English term CSR is chiefly been used and authors mostly refer to Anglo-American scientific papers (Schmidt 2009, p. 11). Thus, CSR in the German academic discourse is gaining in importance (e.g. Gazdar et al. 2006, p. VII). 13). For more detailed descriptions of CSR in the US and in Germany, the author refers to Googin and Rochlin (2008) and Backhaus-Maul et al. (2008) respectively. Corresponding to the current prevalence of CSR, a development of diverse forms of CSR-related activities can be observed (Ellen, Webb, and Mohr 2006, p. 148), particularly as resulting benefits are increasingly being recognized, e.g. there is evidence that customers are willing to support CSR practicing corporations (e.g. Brown and Dacin 1997, Sen and Bhattacharya 2001, Ellen, Mohr, and Webb 2000). All those activities have in common that they do not strictly strive for the maximization of profits (Houghton, Gabel, and Williams 2009, p. 447) and they are applied by companies to demonstrate that they behave socially responsibly (Münstermann 2007, p. 103). In this thesis, it will be referred to CSR initiatives in a marketing context as proposed by Kotler and Lee (2005). They define them in the following way: “Corporate social initiatives are major activities undertaken by a corporation to support social causes and to fulfill commitments to corporate social responsibility” (Kotler and Lee 2005, p. 3). As such, six activities have been identified as the most relevant types: cause promotion (CPR), cause-related marketing (CRM), corporate social marketing (CSM), corporate philanthropy (CP), employee volunteering (EV), and socially responsible business practices (SRBP). Short descriptions of each of them and their respective characteristics can be seen in table 2 (Kotler and Lee 2005, pp. 22). Those initiatives can be subdivided according to different criteria. First of all, they can be categorized by their belonging to the internal or external dimension of CSR (e.g. Schmidt 2009, pp. 20, Houghton, Gabel, and Williams 2009, pp. 477). The internal dimension refers to corporate management and control and is CSR within business operations, also called the “internal face” of CSR (Houghton, Gabel, and Williams 2009, p. 478). Hence, it concentrates on business practices and their compliance with legal and ethical standards, as well as internal stakeholders such as employees. It is often put on a level with the concept of corporate governance and comprises activities such as environmentally-friendly production and safety at work. From the mentioned six initiatives, this is the case for SRBP. The external dimension, in contrast, focuses on the interests of external stakeholders like customers and is CSR outside of business operations, i.e. the “external face” of CSR (Houghton, Gabel, and Williams 2009, p. 478). It manifests itself in the form of the concept of corporate citizenship for the company to be appreciated as a good citizen by society. To achieve this, the company voluntarily follows up its social responsibility and contributes to combining societal and corporate interests in order to create a win-win situation. With this, it is a strategic approach that primarily aims at simultaneously enhancing the welfare of society and the sustainable existence of the company by means of activities that are visible to all. Within the framework of corporate citizenship, firms have different instruments at their disposal (e.g. Schmidt 2009, pp. 22) which can be CPR, CRM, CSM, CP or EV. They are assigned to the discretionary level because they are socially desirable actions but are discretionary for the companies can decide whether and which of them they want to carry out, in which frequency and to which amount (Chen, Patten, and Roberts 2008, p. 132). Moreover, the activities can be systematized corresponding to the resources that are involved. These can be either financial and tangible resources, intangible resources such as time or expertise, or no resources at all. Yet, with an increasingly strategic orientation, this last criterion is blurring more and more as both types of resources can also be similarly used. EV, for instance, is often combined with providing equipment or cash grants (Kotler and Lee 2005, p. 177). In total, the following categorization scheme as depicted in figure 2 can be created (Münstermann 2007, p. 103). In order to not go beyond the scope of the paper and with regard to the forthcoming data acquisition, the current experiment concentrates on the three activities CRM, EV, and CP. The reason for that choice is that they are most appropriate for the aim of the study: first of all, they are all part of the external dimension. With this, they aim at stakeholders outside of the company and therefore they can all be combined with integrating customers. Secondly, they differ enough in order to be compared. EV stands out against CRM and CP because here intangible resources like employees’ time and expertise are used. Though CRM and CP both include financial or tangible resources, they can be distinguished by the fact that CRM is tied to sales and thus influenced by customers whereas CP is not and instead consists of a direct one-time and short-term donation. The other three activities are neglected because financial and tangible resources as is the case in CPR are taken into account in CRM and CP, and intangible resources like in CSM are included by means of EV. Eventually, SRBP is not suitable as it is part of the internal dimension and thus CI is, by implication, not possible. The next three paragraphs, therefore, contain more detailed descriptions of these three activities each. They will all start with a definition and specific constituents, which will be followed by two examples, one of America and one of Germany each. After that, both general benefits and potential critique will be pointed out with subsequent recommendations for a successful implementation. Although there are certain overlaps between those practices, especially with regard to advantages and disadvantages, it is attempted to demonstrate the respective particularities. CRM is an instrument of CSR that is defined by Kotler and Lee (2005, p. 81) as being existent when “a corporation commits to making a contribution or donating a percentage of revenues to a specific cause based on product sales.” With this, it is a marketing-program with two main objectives: making a profit by selling products and supporting a cause at the same time (Varadarajan and Menon 1988, p. 59). Typical components of CRM are, therefore, a product or service on whose sale the contribution depends. Here, CRM can focus merely on one specific product, several products or all products of the respective company. The second important constituent of CRM is a charity or a cause with which the company works together and that is supported through the campaign. Moreover, time frame and contribution need to be determined: CRM can either take place during a definite period of time or it can be open-ended. The contribution generated through CRM can involve a fixed amount of money or a percentage of the profit generated with the sold product(s) (Kotler and Lee 2005, pp. 81). A distinctive feature of CRM is that unlike uncombined giving of other CSR activities, the amount of money is dependent on the business success as this donation is connected “to customers’ engaging in revenue-producing transactions with the firm (exchange of goods or services for money)” (Varadarajan and Menon 1988, p. 60). One of the earliest examples of CRM in the US and simultaneously the pioneer of this type of advertising was the campaign by American Express in the 1980s. American Express worked together with a nonprofit organization (NPO) which aimed at raising funds to restore the Statue of Liberty. Instead of just giving money, American Express made a contribution every time people used their cards and whenever a new card was applied for (e.g. Kotler and Lee 2005, p. 82, Varadarajan and Menon 1988, p. 59, Barone, Miyazaki, and Taylor 2000, p. 248). In Germany, CRM mostly became popular in the early 10s of the 21st century due to the CRM campaign by the brewery Krombacher (2010). This beer label worked together with the environmental organization WWF (World Wide Fund For Nature) and promised to safe a piece of the rainforest with every crate of beer sold. Despite all the above mentioned advantages, CRM belongs to the most controversial of marketing approaches (Drumwright 1996, p. 71) and for this reason, certain concerns are also involved. One of the most crucial problems is that consumers tend to be skeptical as this social activity is directly connected to making a profit and therefore, some customers might suspect more egoistic than altruistic reasons on the part of the firm (Barone, Miyazaki, and Taylor 2000, pp. 249, Kotler and Lee 2005, pp. 100). The success of such an advertising campaign, therefore, is mainly contingent upon the attributions consumers make of the company’s motives for carrying out a CRM campaign (e.g. Barone, Miyazaki, and Taylor 2000, p. 249), i.e. if CRM is perceived as cause-related or cause-exploitive. Apart from this, the payoff of a CRM campaign is further based on additional factors. In an exploratory study, Drumwright (1996, p. 72) summarized that these success factors are among others the type of cause (national or local focus), the type of product (luxury or practical) and the amount of the donation. Moreover, campaign strategy and company-cause fit play a role in this connection. As far as company-cause compatibility is concerned, however, conceptual papers and empirical studies come to different conclusions. Some advocate a high fit (e.g. Rifon et al. 2004) and others advise against it (e.g. Drumwright 1996). In their study with retailers, Barone, Norman, and Miyazaki (2007) tried to give an answer to these ambiguous conclusions. They discovered that this phenomenon is quite complex because customers’ perceived motivation of the company and customers’ affinity to the cause, as well as the interaction of both moderate the importance of company-cause fit. Here, the perception of the firm acts as a positive moderator so that assumed good motivations of the company lead to a stronger fit-evaluation effect whereas the perception of the cause constitutes a negative moderator, i.e. more positive attitudes toward the cause result in a weaker fit-evaluation effect. Consequently, before developing a CRM strategy, it should be examined how the company and the cause are assessed by customers as they both influence the relevance of fit between the company and the cause (Barone, Norman, and Miyazaki 2007, pp. 442). In any case, as the use of CRM is increasing, all these criteria need to be carefully considered when aiming at a successful CRM campaign. Unlike CRM, EV is a CSR activity that mainly involves material resources as can be seen in figure 2. According to de Gilder, Schuyt, and Breedijk (2005, p. 143) a definition of EV reads as follows: “one of the new ways used by companies to demonstrate their social responsibility is to encourage employee volunteering, whereby employees engage in socially beneficial activities on company time, while being paid by the company”. With this, it is an initiative that directly involves a firm’s employees but is usually carried out outside the work. It is either organized by the company or supported by it by backing the workers in doing so through, for example, paid time off (de Gilder, Schuyt, and Breedijk 2005, p. 144). This volunteering may take place in partnership with a NPO or it can be a stand-alone effort. As said, unlike giving money, the activity includes support in the form of employees donating their expertise, talents or physical labor but can additionally involve in-kind contributions such as equipment (Kotler and Lee 2005, pp. 175). While doing so, the workers can play a part in projects of different types such as contributing to local communities (e.g. visiting children in hospital), improving health and safety for individuals (e.g. conducting car-seat safety check) or protecting the environment (e.g. cleaning parks) (Kotler and Lee 2005, pp. 177). Today, it has developed to a global phenomenon and is performed by both small and large firms alike (Peloza and Hassay 2006, p. 358). In the US, as an illustration, 9 out of 10 firms provide support in the form of EV (Tuffrey 1997). A famous example of EV in the US is the company Timberland with its program “Path of ServiceTM”. Here, employees are offered 40 hours of paid leave each year for community service. Being launched in 1982, Timberland today can highlight a commitment in over 200 community organizations in 13 countries, 26 states, and 73 cities (Kotler and Lee 2005, pp. 192). In Germany, the program “Ehrensache” of the HypoVereinsbank (2010) can be mentioned. This contains that bank employees are encouraged to bring in their knowledge or talent to charitable organizations. To do so, they can take two days of special leave. EV differs from other CSR practices because it incorporates the employees personally and they need to become active (Houghton, Gabel, and Williams 2009, pp. 480). With this, a new aspect needs to be considered, namely the reasons of why workers show commitment within the frame of volunteering programs. Here, different kinds of motives (for employees’ participation) have been found out: first of all, there are altruistic reasons. These are connected to the wish to do something good for society and are often referred to as “warm glow” feelings (Andreoni 1990), which describe positive emotions associated with pro-social helping behavior (Peloza and Hassay 2006, p. 362). Moreover, these can be egoistic motives which involve the striving for benefits in return (Houghton, Gabel, and Williams 2009, p. 481, Peloza and Hassay 2006, p. 361) like knowledge acquisition or social networking. Career-based motives such as being positively perceived by superiors or improving one’s profile in the company as well as the want to support the employer are further factors influencing employees’ decision to attend such an activity (e.g. Peloza, Hudson, and Hassay 2009, p. 372). Mostly it is a mixture of those motives. As distinguished from other CSR initiatives, EV contains both internal and external effects together (de Gilder, Schuyt, and Breedijk 2005, p. 143): on the one hand, it is good for the company’s reputation but at the same time also for the culture within the firm. In this way, the employer benefits from it by an improved corporate and brand image since the firm is associated with positive social commitment, and demonstrates concern and intention to do well (Houghton, Gabel, and Williams 2009, p. 481). Similarly, it also builds alliances with communities which can result in more positive feedback on the part of customers and other stakeholders (Kotler and Lee 2005, p. 178, Peloza, Hudson, and Hassay 2009, p. 371). It was also figured out that such corporations are being preferred as entrepreneurs (Turban and Greening 1997). Timberland, for examples has been ranked by Fortune Magazine as one of the 100 best companies to work for (Kotler and Lee 2005, p. 192). Inside of the corporation, advantages such as improved employee attendance, morale, and attempt for a high performance can be mentioned. Enhanced teamwork is a further beneficial outcome as was found out in an exploratory study with employees of the Dutch ABN-AMRO bank (de Gilder, Schuyt, and Breedijk 2005). The employees themselves profit by it due to benefits as shown in their motivations for participating as mentioned above, like experiencing social contacts with other volunteers (de Gilder, Schuyt, and Breedijk 2005, pp. 148). All in all, EV creates a win-win-win situation just like CRM with the only difference that instead of the customer, the focus is on the employee as a third beneficiary (Welsh 1999). In connection with EV, the most obvious disadvantages are that this activity could be exploited by workers who are not motivated for their primary task. Moreover, some employees might not like it and might feel the force to participate without actually wanting to, which can lead to discontentment and for this reason also diminishes their motivation for their actual work (de Gilder, Schuyt, and Breedijk 2005, p. 144). Additionally, EV is an expensive CSR initiative with so many given hours of potential productivity (Kotler and Lee 2005, p. 191). At this, employees could also wish the company to spend the money on other issues which they consider more relevant (de Gilder, Schuyt, and Breedijk 2005, p. 144). This can likewise lead to unhappiness with similar consequences as just mentioned. Furthermore, it is more difficult to publicize this type of CSR as advertising is not automatically involved and it can be difficult to establish the connection between the social action and the company and its brands respectively (Kotler and Lee 2005, pp. 191). For a successful employment of EV, it is mostly important to motivate employees to take part in it (Peloza, Hudson, and Hassay 2009, pp. 382). This can happen on the one hand by choosing projects that suit the company’s core business and needs and therewith the passion of employees (Peloza, Hudson, and Hassay 2009, Porter and Kramer 2002). On the other hand, recognizing and rewarding employees for their efforts are further incentives for attendance (Peloza, Hudson, and Hassay 2009, pp. 383). In order to become more visibly connected to the company, it is advisable to embed volunteering programs into the broader CSR strategy of the firm with a tie to other CSR activities such as CP (Kotler and Lee 2005, p. 192). CP is also referred to as corporate giving and, by definition, is described as “gifts given by corporations to social and charitable causes” (Wang, Choi, and Li 2008, p. 144). It belongs to the most traditional ways of companies fulfilling their social obligations (Kotler and Lee 2005, p. 144) and deals with supporting issues such as education, culture and arts, minorities, healthcare, or it consists of relief funds for victims of natural disasters (e.g. Crampton and Patten 2008). In its original form, it mainly involved giving money. With increasing pressure from stakeholders, however, it turns into a more strategic direction (Porter and Kramer 2002, p., Wang, Choi, and Li 2008, p. 144), which implies an orientation towards the company’s business goals, an attempt to bring about long-term relationships with the recipients, and a break with traditional money giving (Kotler and Lee 2005, pp. 145). As a result, there is a variety of possible gifts apart from cash donations such as awarding scholarships, offering grants, providing facilities or donating products and services (Kotler and Lee 2005, p. 146). Typical beneficiaries of those donations are NPOs, foundations with the organization, or public agencies such as schools (Kotler and Lee 2005, p. 147). Though it belongs to the oldest of CSR activities, it is still on the rise, as contributions from large multinational corporations increased by 5.6 percent in 2007 (study by the Committee Encouraging Corporate Philanthropy 2008, Lev, Petrovits, and Radhakrishnan 2010, p. 182). As was found out in a study by Wang, Choi, and Li (2008), this type of CSR activity is mostly conducted by larger and older firms. Other factors influencing it are slack resources, debt ratio, R&D and advertising expenditures (Wang, Choi, and Li 2008). CP can be distinguished from CRM and EV because the donation is first of all not tied to and dependent on sales and for another thing, it does not necessarily involve employees’ participation (Kotler and Lee 200, p. 144). In the US, for example, the company General Mills supports the American Dietetic Association Foundation by providing funds from the General Mills Foundation, which amounts up to $1 million. This grant is meant to help young people improving their eating and physical activity patterns (Kotler and Lee 2005, pp. 159). In Germany, the Deutsche Bank (2010) often gives ad-hoc donations in case of natural disasters and in its latest project, the company gave drinking water to school children in China who had to suffer from a period of drought. Advantages related to CP mostly deal with the question of whether it can be positively connected to the company’s profitability. Though there are inconsistent answers (e.g. Orlitzky, Schmidt, and Rynes 2003), in a study conducted by Lev, Petrovits, and Radhakrishnan (2010), it was proven that it can enhance a company’s financial performance as CP mostly leads to customer satisfaction and loyalty, which in turn boosts sales. This is further reinforced by additional benefits such as enhanced company reputation and increased firm’s name recognition among customers when being well-designed (Lev, Petrovits, and Radhakrishnan 2010, p. 185, Wang, Choi, and Li 2008, p. 144). Moreover, there are other gains like attracting and retaining motivated staff (Wang, Choi, and Li 2008, p. 145) and risen community goodwill (Kotler and Lee 2005, p. 152). In case of negative publicity, CP can also work as a means of maintaining this goodwill and it can build relationships with stakeholders leading to more control over external resources that are necessary to the company’s survival, e.g. workforce or materials (Wang, Choi, and Li 2008, pp. 144). Of course, the cause and the recipient of the donations profits by it, too because they are provided with necessary money or goods. Notwithstanding those benefits, CP entails disadvantages. Even though it has been proven that CP can be profitable for companies, it was also found out that this relationship is more complex as several factors can have an influence, e.g. a firm’s environment. Moreover, it was proven that the relationship is non-linear for with increasing donations, more costs in the form of cash, products, and facilities are involved (Wang, Choi, and Li 2008, p. 156) so that the positive effects are leveled off and instead of improving a corporation’s financial performance, it might also be detrimental to shareholders (Wang, Choi, and Li 2008, p. 146, Lev, Petrovits, and Radhakrishnan 2010, p. 182). Critics also argue that it is used as a legitimization tool for a company’s poor performance in other social domains, which are not consistent with social expectations, e.g. non-environmentally-friendly production processes. This was confirmed in a study by Chen, Patten, and Roberts (2008). Besides, it can be accused of being just another means to improve corporate bottom lines without real philanthropic intentions. In a study investigating whether economic motives still play a role in tremendous natural catastrophes like the terrorist attacks on the World Trade Center on September 11, 2001 or the Southeast Asian Tsunami on December 26, 2004, it was demonstrated that “even in times of heightened social pressure following catastrophic events, CP is constraint by economic concerns” (Crampton and Patten 2008). In order to prevent such negative associations with CP, it is foremost important not to compensate involved expenditures at the expense of stakeholders like in the form of increased prices (Bhattacharya and Sen 2004, p. 18). It is rather suggested to exactly determine the amount of corporate giving which is effective so that the costs do not exceed the profits made through CP and that customers do not become doubtful due to excessive giving (Wang, Choi, and Li 2008, p. 156). What is more, for a believable implementation of CP, it is indeed necessary to bring it into line with the company’s CSR strategy, and it should not be a single practice in the area demonstrating social concern. Moreover, it should fit the company’s core business. In the same way, CP should not be over-emphasized via public relations but should be spoken about in an appropriate manner (Kotler and Lee 2005, p. 163). The amount of donation should not be exaggerated but be justifiable towards stakeholders (Wang, Choi, and Li 2008, p. 156). With this in mind, CP can be a reasonable instrument for showing social responsibility and can lead to positive outcomes, which will be discussed in the next section. There are several empirical studies that examine the performance outcomes of CSR, particularly in terms of primary stakeholders’ attitudes and behavior toward the respective organization. It was already mentioned that the goal of the paper is to complement academic research in the face of CI and a comparison of single CSR activities, both regarding the effects on customers. In the following two sections, therefore, an overview of the literature considering specifically the responses of customers will be given and with this, on overview of the present research will be provided. This will start with studies considering broader CSR programs in general. By doing so, the main effects and underlying mediators will be mentioned first, which will be followed by moderating factors. After that, a review of literature comparing single CSR practices will be presented. This will consist of studies likening the respective CSR practices of this paper, which are CRM, EV, and CP, but also of additional comparisons found in academic research. Basic theories of the studies can be found in the literature review in appendix A. Some of them will then be also dealt with in more detail and thus will be described in the subsequent theoretical framework. In general, a number of studies addressing multiple CSR initiatives (i.e. a CSR program) have mainly found company-favoring effects of CSR from customers. So, assuming an awareness of a company’s CSR program, it was proven - in experimental settings – that it often has a favorable influence on customers’ attitudes, such as toward the brand (Klein and Dawar 2004), toward the company (e.g. Wagner, Lutz, and Weitz 2009, Sen and Bhattacharya 2001) and through the influence of the overall evaluation of the company also toward this company’s products (e.g. Brown and Dacin 1997). Moreover, it leads to an identification with the company, i.e. customer-company identification (=C-C identification) which increases the likelihood of other positive CSR-related reactions (e.g. Sen and Bhattacharya 2001, Du, Sen, and Bhattacharya 2007, Sen, Bhattacharya, and Korschun 2006). CSR research also indicates its positive effect on customers’ CSR beliefs, i.e. their assessment of the extent to which a company is socially responsible (e.g. Sen, Bhattacharya, and Korschun 2006) whereby CSR belief was mostly discovered to mediate the relationship between an awareness of CSR and other outcomes like C-C identification (e.g. Du, Sen, and Bhattacharya 2007), also in case of inconsistent information about CSR (e.g. Wagner, Lutz, and Weitz 2009). In addition, beneficial impacts like a greater intent to purchase the company’s products (e.g. Sen, Bhattacharya, and Korschun 2006, Mohr and Webb 2005) were detected. In a study focusing particularly on the retailer environment, the perception of CSR directly lead to corporate benefits such as store loyalty, emotional attachment to the store and store interest which was also reached indirectly through C-C identification as a mediator. Those perceptual benefits, in turn, translated into behavioral outcomes like purchases done at the store (Lichtenstein, Drumwright, and Braig 2004). It was also discovered that customers are more sensitive towards negative CSR information than they do approve of a positive perception of CSR (e.g. Sen and Bhattacharya 2001) and that they are even ready to sanction socially irresponsible companies by, for example, boycotting them (Sen, Gürhan-Canli, and Morwitz 2001). Luo and Bhattacharya (2006) report that CSR forwards customer satisfaction, which in turn increases a company’s financial performance and with this its market value. This is mainly achieved through more sustained patronage of the socially responsible company on the part of customers (e.g. Ellen, Mohr, and Webb 2000) in the form of loyalty (e.g. Maignan, Ferrell, and Hult 1999, Bhattacharya and Sen 2003), positive word-of mouth (Handelman and Arnold 1999, Bhattacharya and Sen 2003) or a willingness to pay premium prices (Creyer and Ross 1997). Beyond that, CSR has been proven to result in customers’ resilience in the light of negative information about a company like in a product harm-crisis (e.g. Klein and Dawar 2004). Most of the just mentioned results, however, are contingent on several factors, so-called moderators. In an extension of Brown and Dacin’s (1997) study, for example, Berens, van Riel, and van Bruggen (2005) find a moderating effect of a company’s branding strategy on the effects of corporate associations including CSR on product evaluation. Additional moderators are CSR attributions corresponding to the motives that consumers assume as underlying a firm’s obligation with CSR initiatives (e.g. Sen, Bhattacharya, and Korschun 2006). These can be either intrinsic, i.e. selfless motives, or extrinsic, i.e. self-interested motives such as exploiting the cause for economic benefits. At this, attributions about intrinsic motives that indicate genuine concern about a cause are likely to trigger more positive reactions towards the company (e.g. Du, Sen, and Bhattacharya 2007). By investigating the conditions under which CSR influences product responses and company evaluation, Sen and Bhattacharya (2001) detected that CSR support, which describes in how far consumers do approve of the CSR activities practiced by the corporation, and the type of CSR as well as CSR and CA belief moderate the impacts of CSR. Osterhus (1997) identified the importance of trust as a prerequisite for rewarding a company for its socially responsible commitment. Furthermore, while examining the circumstances under which CSR activities are effective, ineffective or do even backfire, Yoon, Gürhan-Canli, and Schwarz (2006) presented salience of benefit (i.e. the degree to which the company obviously will benefit from CSR) , source of information (i.e. if the customers receive information about CSR from that company or from a neutral source) as well as CSR/advertising ratio, which describes money spend on CSR in proportion to money spend on advertising, as moderators because they influence the perceived sincerity on the part of consumers regarding the underlying motives of a company’s CSR behavior, which then again determine the success of CSR. An overview of all mentioned customer outcomes and possible moderators can be seen in the following table. All in all, it can be summarized by following the conceptual paper of Sen and Bhattacharya (2004) that academic research has detected two types of reactions from customer to CSR activities by companies: internal company-related outcomes shown in attitudes including loyalty and evaluations, attachment, attributions, beliefs and intentions, which are likely to turn into external, i.e. observable, outcomes revealed in behaviors such as positive word-of-mouth, product purchase, or resilience toward negative information. Moreover, it has been conceptualized that CSR responses from customers are multistage, multidimensional, they differ from customer to customer, i.e. they are heterogeneous and they are also contingent as described in the previous paragraph (e.g. Sen and Bhattacharya 2004, Sen, Bhattacharya, and Korschun 2006, Webb and Mohr 2005). More detailed information related to all studies in view of variables, data, method of analysis and theories are provided in appendix A. Academic research concerning a comparison of the customer-related effects and perceptions of different CSR activities has been rather sparse so far. This similarly emphasizes again the need for its further investigation. Few studies, however, have dealt with comparing single CSR activities. Dean (2003), for example, examined the outcomes of CRM in contrast to CP. He found out that the reactions are dependent on the company’s image such that both types of activities lead to favor with customers for irresponsible corporations; for responsible firms, neither type of donation resulted in beneficial effects. Finally, for companies with an average reputation, only CP was positively appreciated but CRM was rather without effect even though it neither did damage the firm’s perception in the eyes of customers. By contrasting consumer perceptions of EV with the ones of CP, EV was found to be judged more positively from consumers than CP because giving time instead of giving money is regarded as more moral and self-expressive. As reasons for this result, higher perceived effort and more motivation, with which EV is credited, were mentioned. Consumers’ self-importance of moral identity was pointed out as the moderator in this connection (Reed II, Aquino, and Levy 2007). Although not directly addressing the activities CRM, EV, and CP in comparison, Menon and Kahn (2003) demonstrate that CRM arouses more positive appreciation from customers than CSM. The result was explained by different extents of elaboration. The more elaboration, that is guessing underlying reasons or judging the appropriateness of a sponsorship action, the less positive is the reaction. This is true for CSM, an activity, which contains a high degree of elaboration because consumers might think of ulterior motives since there is no obvious reason for its implementation such as directly increasing sales with it. Moreover, by investigating an institutional CSR program versus a promotional CSR program, the institutional approach showed a higher positive influence on customer responses such as loyalty, purchase intent, attitude towards the company as well as the company’s reliability. The institutional CSR program is used in a more comprehensive way, focusing on different CSR categories and considering all stakeholders with the aim of reaching long-term effects whereas the promotional program is a short-term approach concentrating on a single activity such as CRM and consumers as a stakeholder group (Pirsch, Gupta, and Grau 2007). Stakeholder management, which implies CSR activities that concentrate on relationships to primary stakeholders, vis-à-vis social issues participation as a broader concept with a focus on components outside direct relationships to primary stakeholders is positively effective whereas the latter has a negative impact on a company’s shareholder value and thus financial performance (Hillman and Keim 2001). A summary of these results can be seen in table 4. In what way CSR leads to favorable company-related outcomes on the part of customers can be explained by means of different theories, which will be presented in the following sections. In the main, these are the SIT connected to the main effects of CSR, as well as AT, Moral Behavior and the BDT for the CSR effects in comparison. Consumers’ reactions to CSR are likely to depend on “the amount of congruence (…) they perceive between the company’s character, as revealed by its CSR efforts and their own” (Sen and Bhattacharya 2001, p. 228) because then, customers feel as a part of it. This is also called C-C identification and can be triggered by CSR. Reasons therefore can be found in the SIT as first formulated by Tajfel and Turner (1979). That theory primarily focuses on explaining people’s behavior by not only considering the individual but by referring to group processes. According to SIT, individuals categorize themselves and others in different groups (e.g. sports club, company, nation etc.) which are involved in defining the self (social identity). The membership to positive groups leads to a positive social identity and with this enhances the individual’s self-esteem. In order to establish such a positive self-esteem, humans overemphasize the good aspects of the in-group, with which they show solidarity but they discriminate against out-groups (Stets and Burke 2000, p. 225). This phenomenon was illustrated in the “minimal group paradigm” which laid the ground for SIT. These are experiments which show that even random assignment to distinct groups brings people to prefer their in-group and discriminate their out-group (Tajfel et al ., 1971). Accordingly, there are four underlying principles of SIT: social categorization, social comparison, social identity, and self-esteem (Tajfel 1978). Social categorization describes the categorization of us and other people into groups to facilitate our understanding of the world by structuring it. The belonging to a group has an influence on our behavior (e.g. wearing special clothes). This categorization leads to social comparison, which implies that we compare our groups (i.e. in-groups) to other groups (i.e. out-groups). The social identity defined as “that part of an individual’s self-concept which derives from his knowledge of his membership of a social group (or groups) together with the value and emotional significance attached to that membership” (Tajfel, 1978, p. 63) is the result of those comparisons. The more positive the comparison in favor of the in-group, the more positive is the self-esteem. The need for an enhanced self-esteem can, therefore, be regarded as the chief motivation for social categorization. When comparing the three CSR activities by looking at different motives that consumers impute to companies when practicing them, it is appropriate to refer to the AT (e.g. Kelley 1973, 1971, Kelley and Michela 1980). This theory acts on the assumption that in general, people will try to devise a commonsense explanation about why something has happened and they will make causal inferences, that is, they will interpret events regarding their motives. According to AT, individuals do so, i.e. make attributions, in order to improve their understanding of themselves and their environment. In sum, “attributions are the result of a cognitive process by which people assign an underlying cause or explanation to an observed event” (Dean 2003, p. 94). Those attributions can either be positive (i.e. imputing good motives) or negative (crediting bad reasons) (e.g. Dean 2003, p. 94). Moreover, it is further claimed that those attributions made by individuals have an influence on their subsequent attitudes and behaviors (Kelly and Michela 1980, pp. 459). In other areas, it has already been proven that consumers do make attributions such as about why a product failed, why a firm’s employees are on strike (Folkes 1988, p. 549) or they draw inferences about missing product attributes from corporate information in their judgment of products (Brown and Dacin 1997). As a consequence it is plausible to conclude that this theory can also be applied to customers and CSR. Moral Behavior (e.g. Kohlberg 1969, Gilligan 1982) implies “behavior that is socially responsive to the needs of others” (Reed II, Aquino, and Levy 2007, p. 179), which is the case for discretionary CSR activities such as CRM, EV, or CP. Yet, in order to decide which of those three activities is perceived as superior to the others, BDT (e.g. Slovic, Fischhoff, and Lichtenstein 1977) comes into play. BDT is an intensely interdisciplinary field that deals with how humans make judgments and choices by drawing on concepts from psychology, economics, or statistics. It refrains from assumptions of economic utility theories such as game theory that are based on human beings who form their opinions as rational actors taking into account all relevant information, balancing costs and benefits, listening to reason in order to reach a decision that maximizes utility and profits (Simon 1955, p. 99, Wilson 2010, p. 687). Instead, BDT considers the premise of “bounded rationality” (e.g. Simon 1955), which suggests that people are not maximizing benefits in a rational way but their decision making is rather characterized by incomplete or irrelevant information and by influences due to emotional factors, biases or logical incoherence. Endowment effect, optimism, risk aversion are examples of those biases (Wilson 2010, p. 688). Moreover, it is stated that humans’ judgments are constrained by limited memories and a difficulty to evaluate future outcomes. This is partly the case because it is necessary for human functioning in the real world. For this reason, BDT concentrates on identifying conditions under which human decision making deviates from those normative rules of decision making (e.g. Einhorn and Hogarth 1981) as developed by other disciplines because these could not be confirmed in empirical studies (e.g. Simon 1959, p. 258).